You may have been first attracted to fish when visiting a public aquarium, or perhaps you have had the opportunity to watch fish in a custom aquarium that friends or family have. The visual beauty of fish and coral is unmatched, bright visual colours, growing corals and the enjoyment of creating a marine environment are all reasons aquariums are so popular around the world and why they give so much pleasure to the observer. For the beginner however the initial set up may seem daunting. Conflicting advise along with a vast choice of systems and different types of filtration it’s no wonder many newcomers are put off before they even start. Marine species are far more sensitive to water quality so it’s essential you are informed about the needs of the inhabitants. Custom installed aquarium require patience and know-how. It is also important to understand marine aquariums can be expensive to run, not only are there electric costs but added products such as salt, buffers and a variety of foods to name but a few. arguably is the easiest and without doubt the cheapest option. This is due to the absence of corals that require more powerful lighting and more complex filtration methods. Lighting is not really an issue on fish only custom aquarium and simple marine T8 tubes will suffice. Only a few additional items are required such as a protein skimmer, power-heads and a three-stage filter. Generally a fish only aquarium may be a community tank containing for example species such as damsels, wrass, tangs and even clownfish. A predatory tank with fish such as lionfish, groupers and possibly eels could be another option. It is important to research any livestock before purchasing, as many are not compatible with each other. It’s generally considered good practice to purchase the largest custom built aquariums you can fit and afford. 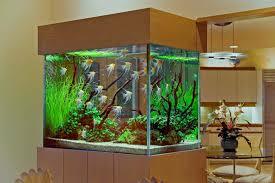 The larger the aquarium the more stable the water will be and the less likely you will incur and problems. In saltwater custom aquariums it is advised that you have the three main types of filtration. These are mechanical, biological and chemical. The first stage of filtration is mechanical. This can be in the form of filter socks that can be removed for cleaning on a regular basis. These remove the larger particles and solids of fish waste or uneaten food, before they have a chance to break down. This in turn puts less pressure on the main biological filter. Another type of mechanical filtration is protein skimming. A protein skimmer is an important addition to any marine tank. Tiny bubbles are produced via a venturi pump or air blower and passed through an acrylic tube along with the aquarium water. The high oxygen content attracts proteins and organic matter, which literally stick to the bubble and are then pushed up out into a dry collection cup. It’s a highly effective form of mechanical filtration. The second stage of filtration is biological. Filter sponges, live rock or porous material can be placed in a sump, which attract nitrifying bacteria that break down harmful ammonia. Other types of biological are de-nitrification filters that are designed to remove nitrate. The last stage of filtration is chemical. Carbon and various resins can be added to target removal of chemicals such as phosphate, nitrates and even silicates. There are other types of filtration such as ultraviolet sterilisers and ozone units. These are generally used as a form of parasite control on fish. Water is passed through a unit and is exposed to one of the above. The free-swimming stage of parasites are then denatured, thus greatly reducing the amount of parasites in a system. They are always used in commercial applications where new fish are being treated. They are not as wildly used in the home aquarium as they greatly reduce the amount of naturally occurring bacteria and planktons. They are however a useful tool should you have a parasite infestation or are quarantining new fish. The foundation of your custom aquarium is the introduction of coral sand. Bacteria colonise here and help with nitrification. Small shrimps and copepods will also take up residence here. Aragonite coral sand is the most widely used, and is arguably the best. The coral sand will act as a natural buffing agent that will maintain your pH to around 8.3. You can also use silica and quartz sands but they are not considered as good as they do not contain any naturally occurring calcium. Newcomers may at first be put off at the expense of live-rock and minimize or even exclude the amount introduced. However it is one of the most important natural filtration methods introduced. Good quality live-rock has a plethora of marine organisms that are extremely beneficial to the system. It matures a new aquarium very efficiently and maintains a constant balance. It also is a refuge for small invertebrates and also fish take up residence here. It is a place for coral to adhere and grow as you would find in the reefs in nature. Live-rock is a natural product that is heavily controlled by CITIES and permits are required to bring this into your country. There are many types of rock such as Fijian, Indonesian and even Tongan all of which are far away and due to transport costs you can now see why it is so expensive. I do believe however it is worth every penny. Strong lighting of the correct spectrum is essential for a reef custom aquarium design. Most corals have algae in their tissue called zooxanthalle. Simply the algae photosynthesis’s just like a plant, and produces food for the coral. This is known as a symbiotic relationship. Without the algae the coral would soon perish. zooxanthalle requires the correct spectrum and intensity of light in order to live. In the custom designed aquariums we are simply trying to replicate nature. There are some corals such as nepthea sp. that are non photosynthetic and thus do not require any light at all. However if these are placed in an custom aquarium with light, unwanted algae can quickly overgrow and kill them. This type of coral is best left to the specialist. In seawater light is actually quickly filtered out, the spectrum of red, orange and yellow are the first to go whilst blue generally penetrates deeper. Ultraviolet penetrates even further. Hard corals such as acropora sp. that are found on the upper reef crests need a higher intensity light that includes all of the spectrum. This can be replicated with high intensity sunlight bulbs such as metal halides or very high output fluorescent. Whereas deeper soft corals such as sacrophyton sp. require a less intense light that is higher in the blue. We can replicate this in the aquarium with the use of actinic bulbs or LED’s, which can reproduce the blue and to some extent the ultraviolet. Lights can come in a vast variety. Power compacts, very high output fluorescents, metal halides, mercury vapour and even LED’s to name but a few. It can be a daunting decision. Lighting units can range massively in price. The decision of what light will depend on what marine animals you are wishing to keep, what size your aquarium and your budget. With the correct guidance and research a marine aquarium husbandry correctly set up and maintained will provide untold hours of ever changing enjoyment.